Bulk Blue Agave (UWC) Agave 55 (55 lbs. / 25 Kg.) $0.11 per Oz. 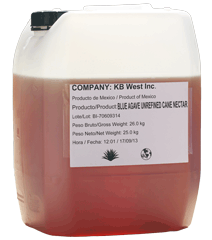 Our Blue Agave Unrefined Whole Cane (UWC) Nectar has a mild and pleasant flavor that is excellent for all your baking and confection applications. Baking with the Blue Agave UWC will build viscosity, maintain humectancy, softness, and excellent for browning.